On November 11 each year, we hold ceremony to honor the divine synchronicity and energy of 11, which is the angel number of perfect alignment and the attraction of the soul mate and soul purpose. This year’s 11/11 Manifestation Kit is different – we are focusing on the ANGELS and their role in manifestation. 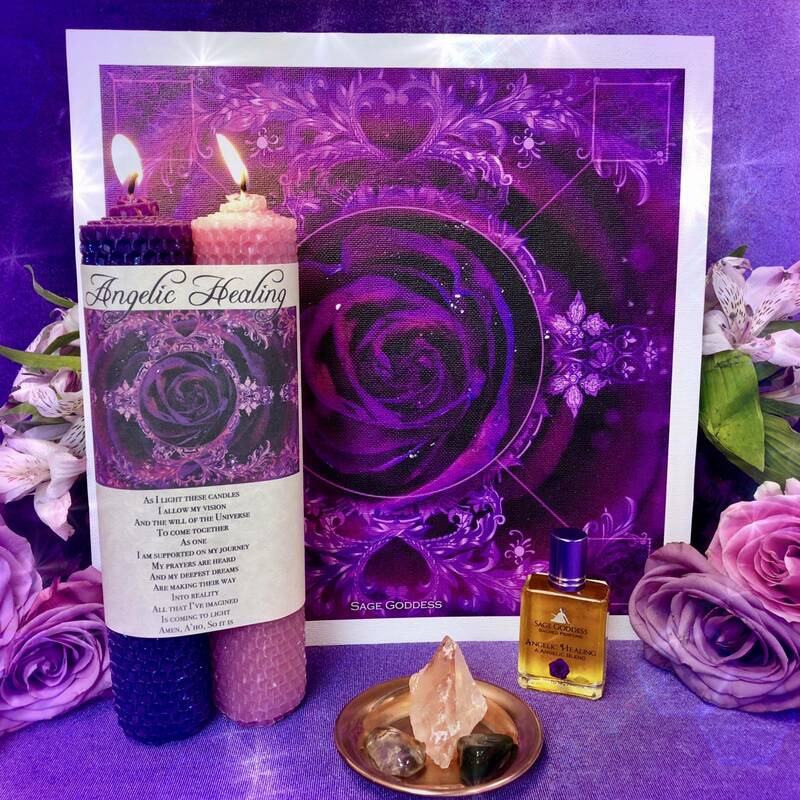 In your set, you receive two candles, one to access the Crown Chakra for divine blessings and the other to access the Soul Star Chakra which is your angelic gateway to manifestation and magic. We will burn both together and then activate four crystals to raise energy for YOUR dreams and visions for the year ahead. November 11 is a powerful seeding time when all of your intentions fuel the manifestations of tomorrow. Don’t be afraid to dream big and hold a big vision in your heart on 11/11; the universe is supporting you! I can’t wait to use these tools with you on November 11. Order now to make sure you have yours in time. To learn more about 1111 and other angel numbers, check out our Numerology page or Angel Numbers page, and join me for my Angel Numbers class series! 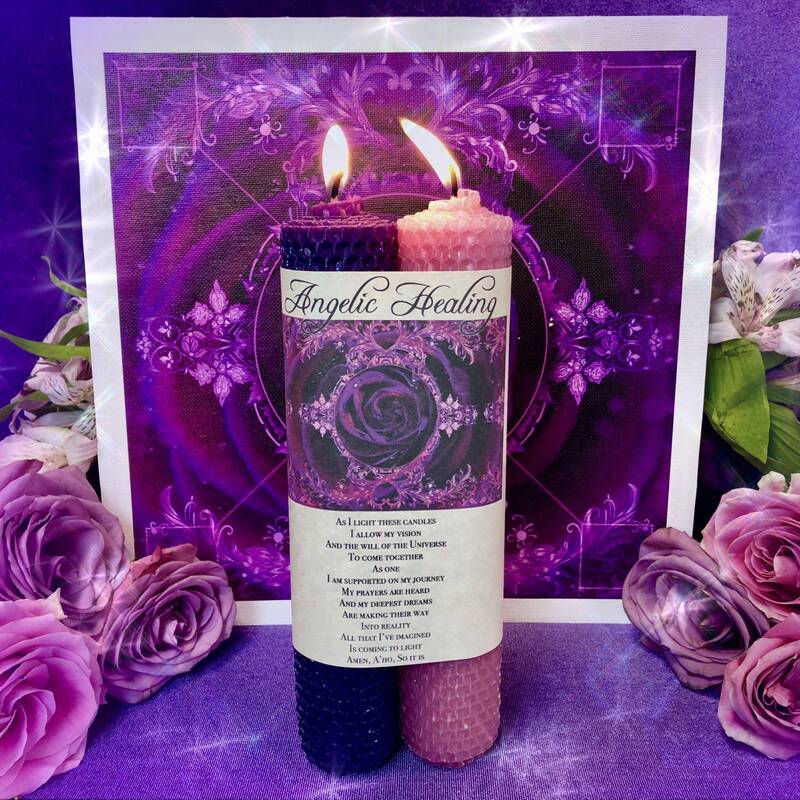 One (1) Angelic Healing Rolled Candle Duo, which consists of two 8″ single-sheet rolled beeswax candles: one in pink and one in deep purple. We will work with both candles in ritual to activate upper chakra magic for manifestations and connect with your healing angels at the Soul Star Chakra, which is their divine home. One (1) copper charging plate (about 3.75”). Copper is deeply healing and grounding, and this copper charging plate can be used to infuse your gemstones and other magical tools with this metal’s rejuvenating energy. You can burn your candles on this plate or use it to conduct the energy of your crystals. One (1) 15 ml bottle of Angelic Healing Perfume. Anoint yourself and your candles with this sacred blend to activate your Third Eye and Heart Chakras while calling in the support of your angels and guides. This perfume was hand-crafted right here at SG Headquarters, with top-quality, high-vibrational oils: Rose attar, vanilla, and bergamot – and its fragrance is divine. To add to the magic, each bottle has been infused with rose quartz and clear quartz chip stones, for amplified magic and heart-opening power. One (1) natural fire quartz. Fire quartz opens a channel from Root to Crown, connecting you deeply with both Mother Earth and the Higher Realms. One (1) tumbled citrine. A stone of manifestation, courage, and Solar Plexus activation, citrine transforms negativity into positivity and infuses your intentions with love, abundance, balance, and stability. It provides mental clarity as you move forward toward your dreams. When the going gets tough and the obstacles arise, this stone will instill you with the strength to overcome it all. One (1) tumbled green aventurine. 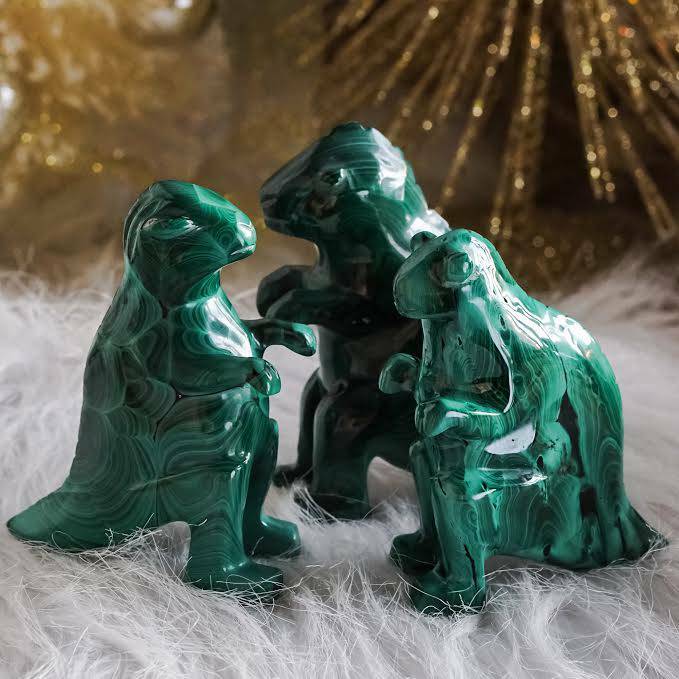 Green aventurine instills you with gratitude, opening channels for more prosperity, growth, and success to flow into your life. 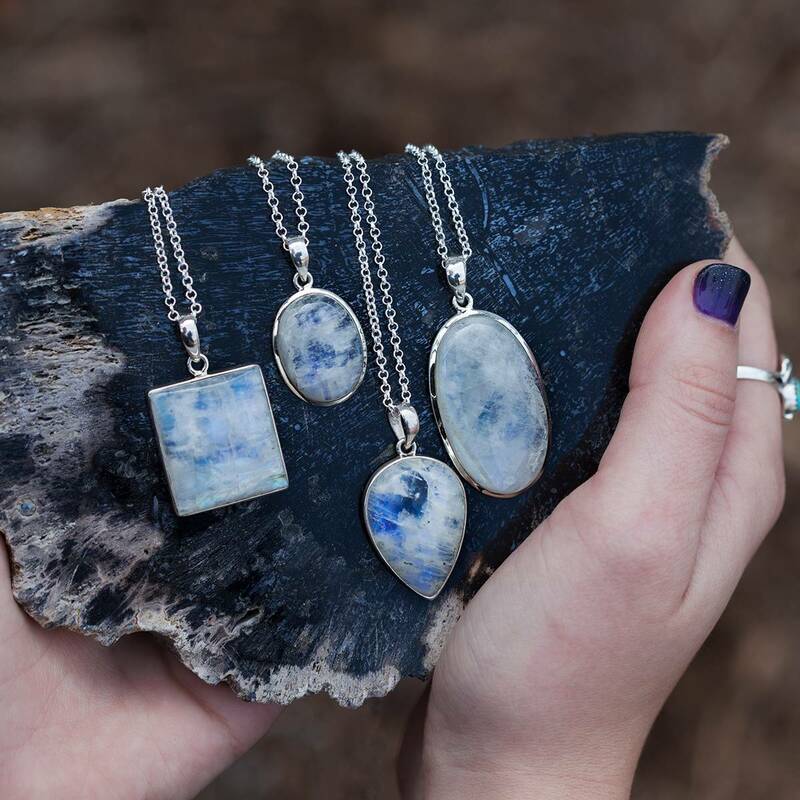 Having this stone as a tangible representation of gratitude will help you focus your energy and attention on creating even more abundance in your life. 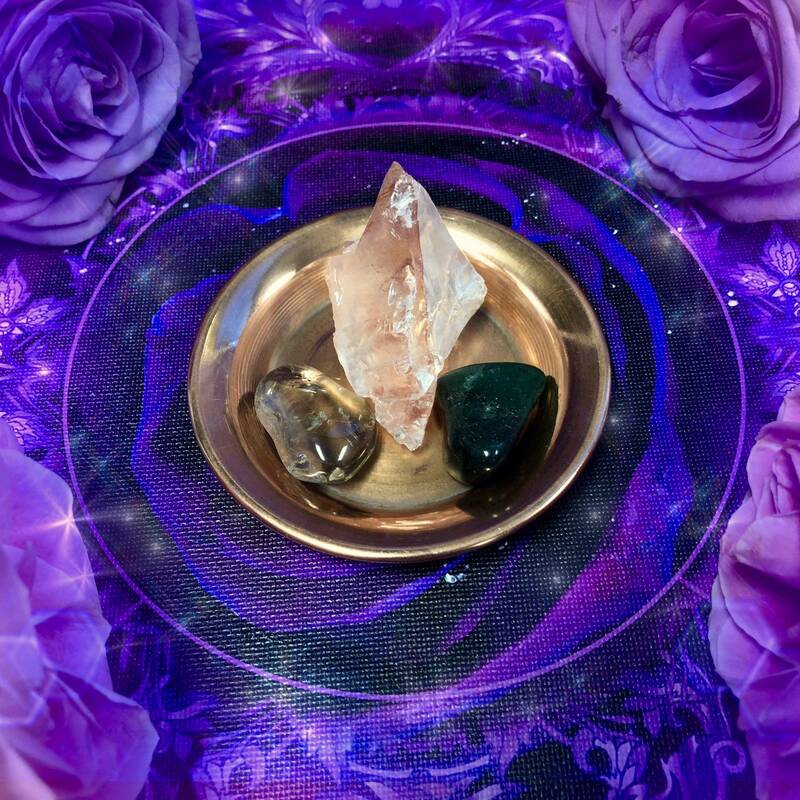 Please note there are FOUR spaces on your grid, one for each of the three stones included and then a fourth space for a crystal from YOUR collection that aligns specifically to your intention for this ritual. What do you seek to manifest!? Bring a crystal with you for that fourth space to anchor the energies. Lastly, you will receive one (1) 10×10” canvas of custom SG artwork. Hang this canvas above your 11/11 Manifestation Altar or use it to house your magical tools. May this special offering draw you closer to your dreams; may it bring all that you wish for into reality! 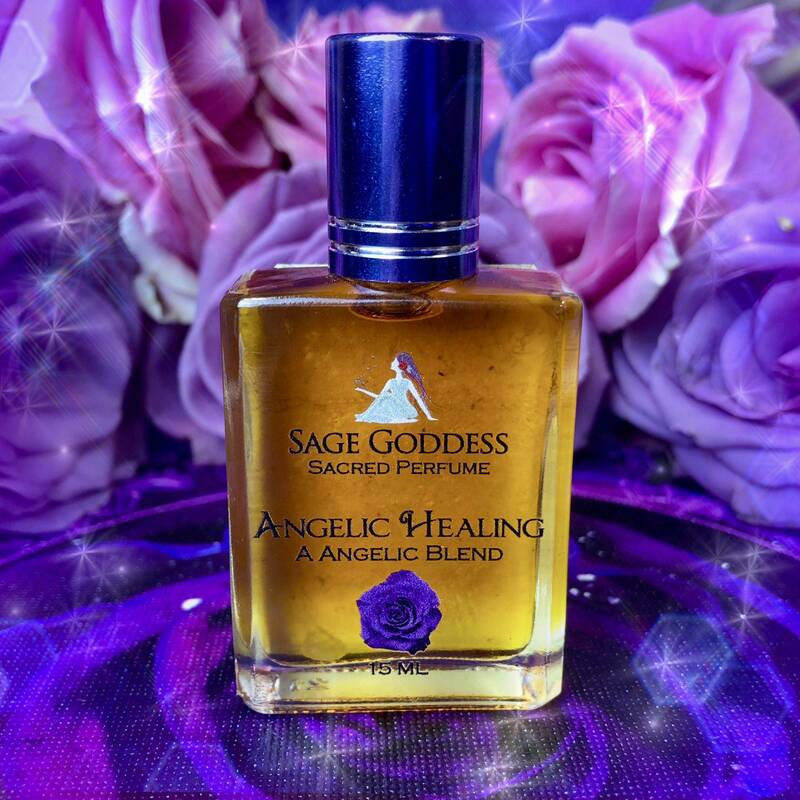 Note: Angelic Healing Perfume is made with natural essential and carrier oils and may contain fragrance oils. Cap color, chip stone, and color may vary slightly. For external use only. Please remove label before burning candles, always use a heatproof dish on a stable surface, and never leave a burning candle unattended. This listing is for one (1) 11/11 Manifestation Kit for Angelic Healing, as described above. Yours will arrive lovingly parceled along with a single leaf of white sage and a parchment describing the properties of the stones. Beautiful Set and Gorgeous Perfume. This ritual set offers a gentle energy yet one that feels powerful. The perfume is an OMG! Heaven scent that I just love. It reminds me a bit of the V perfume, yet slightly lighter.